Coming from different parts of Canada and Jamaica, we're a team of three programmers who believe in simplicity, reliability, and convenience. We're also extreme fanatics of music, with skills ranging in iOS development, Android development, back-end and front-end. Our combined collaboration, in terms of skills provides us with the tools to perform and this performance is very well portrayed in our project - fun, addictive, and musically appealing. Our product allows you to turn your basic arm movements into musical notes that can be used for easy song composition. 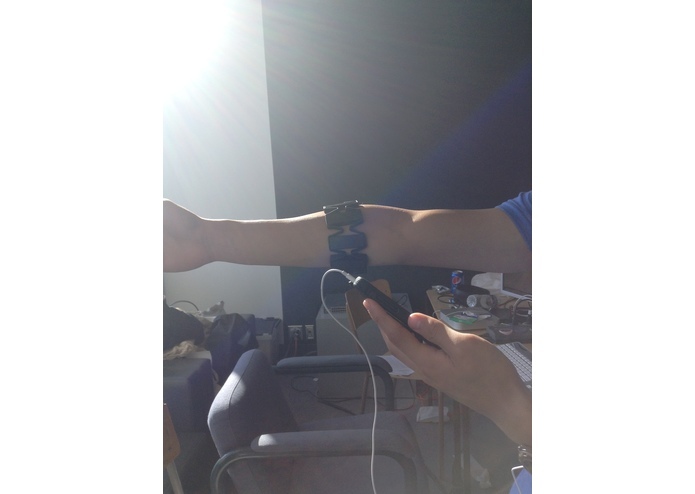 Using the MYO armband, we're able to turn the armband's gestures into musical notes for any instrument using the Android platform. Our first instrument for this hackathon is the theremin. On screen, the user is able to select the instrument of their choice (theremin), and compose their music. They also have the option of viewing their arm-pitch-frequency-tone representation on a graph on screen to vary and create more professional sounds. At the end of the composition, the user has the option of replaying their newly made music, and then can be stored in a cloud and compared to other users' compositions for analytics, to make future experiences better.